Paging Dr. Jezebel: Does Amy Winehouse Have Oral Cancer? 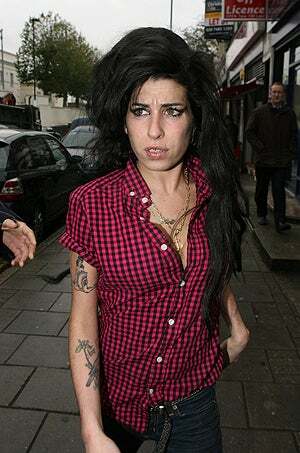 Amy Winehouse was caught by photographers on her way to visit her husband, Blake Fielder-Civil, in jail. Amy looks pretty good, except for that red spot on her lip. What's the matter, Amy? After the jump, it's Dr. Jezebel (total misinformed quack!) to the rescue. We headed over to our favorite hypochondria-inducing application, WebMD's symptom checker, and focused on the head. After choosing "mouth sores" as the symptom, we were asked: "Mouth sores along with: long term smoking long term alcohol use, or none of the above." Well Ms. Winehouse does smoke and drink — so if by long-term you mean "constant," then, yes and yes! After those were checked off, WebMd asked if the mouth sores were brought on or made worse by "swallowing irritating chemicals or poison" or by "ingesting hot food or drink." We couldn't be sure! We skipped that part. We ended up with eight conditions: Mouth (oral) cancer, Coxsackie virus infection, canker sores, esophagitis, pemphigus, thermal burn of mouth or tongue, ulcerative colitis, Crohn's disease. Coxsackie virus causes sores in the throat. That's not it! So. Is it a canker sore? "Canker sores have a red border and white or yellow center. They may be painful and can make it hard to talk and eat... Unlike cold sores, you cannot spread canker sores to other people." (Oh wow, who knew they could be caused by stress, getting your period, food allergies and hurting your mouth?) But Amy's little blister just doesn't look like a canker sore, so we crossed that off the list. A thermal burn is possible, but not probable. We also ruled out esophagitis (inflammation of the esophagus), pemphigus (a rare autoimmune skin disodrer that causes blisters), colitis (although we did learn what a toxic megacolon is) and Crohn's. Which leaves us... (oh no!) with oral cancer. WebMD instructs us to contact a doctor! A real doctor, that is. The odd thing is that herpes was never an option. We had to search for it. But if we had to go by the horrifying illustration, we'd say uh, no. Cancer it is! Although we're not professionals. So maybe it is a cold sore. P.S. If you need to quit smoking, just Google images of "oral cancer." Earlier: Paging Dr. Jezebel: Does Amy Winehouse Have A Rare Blood Disease? Oh No: Does Amy Winehouse Have Syphilis? Paging Dr. Jezebel: Does Amy Winehouse Have A Rare Blood Disease?